There's something about garden bounty that inspires me to use it or preserve it. This year, we have 3 tomato plants that I purchased, 3 that were given to me by a neighbor, and 4 that volunteered from last year's windfalls. Add that to a coworker who has an absolutely amazing garden, and I always have too many tomatoes. Unfortunately, I am the only one in my house that will eat tomatoes raw. I have had to find a way to use these beauties up! 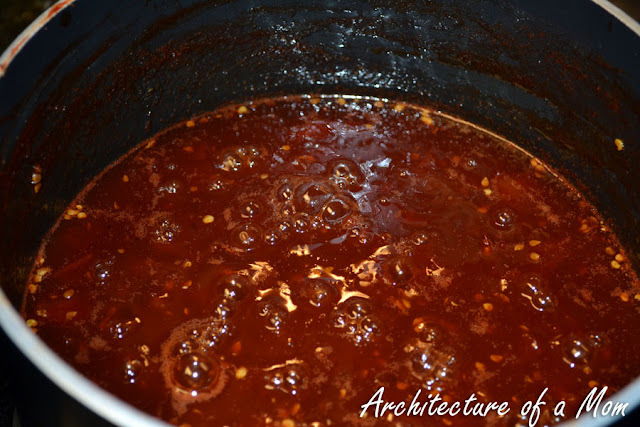 One way is to make salsa, but since my three kiddos have not yet developed a taste for the spicy, I only make one or two batches in a season. I have made slow roasted cherry tomatoes, like what I used in my slow roasted tomato foccaccia, but I found myself needing another way to preserve the bigger tomatoes. Enter my favorite source for preserving: Food in Jars. One of Marisa's ways to preserve the tomato harvest is to make tomato jam. Once I tried this amazing condiment, I knew I would be making it every year. It definitely helps that not only does it taste amazing, but you don't remove the tomato skin or the seeds--super easy in the tomato preserving world! What's tomato jam? Picture ketchup, but sweeter and spicier but not quite like barbecue sauce. And picture a condiment that you spread like jam rather than squirt, and that's tomato jam. Last summer, I made Marisa's recipe. But this summer when I went to make a batch, I realized I didn't have any limes. Oops. And I had all those tomatoes, and I had enough energy to go to the store or make the jam--not both. So I decided to improvise just a little. Since lime juice is acidic which is very important in canning and preserving in general, I decided to replace one acid with another: apple cider vinegar. I also have adapted the method a little to what works for me. And when I finished, my husband got a taste and said it was better than the original recipe! So I think I'll be making it this way from here on out. Turn your burner to medium-high. Throw the tomatoes into a non reactive (medium to large size) saucepan. Throw all the other ingredients into the sauce pan. Stir to combine the ingredients. Allow to come to a boil and then turn the temp down so you're just simmering. I put it on medium-low so I can walk away for 15-20 minutes at a time--you know, to referee between children. You do want to stir occasionally though, to make sure you don't burn the jam, especially the longer it goes. The color is closer to a tomato paste color (this is assuming you are using red tomatoes, if you are using a yellow, orange, or purple variety, you'll have to adjust accordingly). The volume will be about 1/3 to 1/2 the original, and the consistency will be very thick. Now, this is where my method varies from Marisa. I think she chops her tomatoes finer and cooks them higher, so her jam might be smoother. I, however, am willing to cheat a little to get a smoother product. While still on low flame, I use my immersion blender and blend until smooth. I cook it on the same temp for five minutes. I then jar it up, and if you want to can it, you process it in a boiling water canner for 20 minutes. However, I use the quilted can or freeze jars...and then I freeze them (after the cans have cooled in the fridge). Yup, I am that lazy when it comes to preserving. That's it! Amazing tomato jam ready to be enjoyed right away, or in months when a real tomato is not readily available! What do you use tomato jam for? I put it on burgers, chicken, and my particular favorite: meatballs. I replace the ketchup with tomato jam in The Pioneer Womans' recipe for barbecue meatballs. Those are truly heaven, I promise, especially in the middle of winter, when you are craving comfort food, and maybe a little bit of summer garden goodness. Sometimes I link up at the following places: 504 Main, AKA Design, A Little Tipsy, Beyond the Picket Fence, Blessed with Grace, Candace Creations, Cheerios & Lattes, Craft-o-maniac, Crafty Scrappy Happy, Eat at Home, Finding Fabulous, Gingersnap Crafts, House of Hepworths, How to Nest for Less, I Heart Naptime, Lil Luna, Live Laugh Rowe, Made in a Day, MomTrends, Not Just a Housewife, One Creative Mommy, Organizing Junkie, Positively Splendid, Simply Sugar and Gluten Free, Six Sisters Stuff, Sugarbee Crafts, Tidy Mom, The Finer Things and I Dream of Clean’s Spring Cleaning Challenge, The Finer Things in Life, The Grant Life, The King's Court IV, Unrefined By Design, Under the Table and Dreaming and Vintage Wanna Bee. Thanks Pam! So glad you're enjoying it! Miss seeing you! This looks fantastic. My husband would love it! Wow, this sounds so unique and delicious. My husband and I have been talking about putting some planters in our backyard to start growing tomatoes. The flavor of home grown tomatoes is amazing. Almost like a dessert. Thanks for the inspiration! Wow, this looks amazing! I will have to make it, even though I don't have any canning stuff yet. I'm so glad you posted this! I've just started canning so I'm looking for recipes. Can't wait to try this one. Hi! Coming to you from the blog hop. I have never heard of tomato jam- interesting. I wonder if my husband would like it better than ketchup (which he is not a fan of). Thanks, have a great week! Gina, I'm not a fan of ketchup either and I love it! Thanks! I appreciate your featuring me!